Before you apply, you should consider whether you satisfy the conditions of eligibility and accept the provisions of the Scheme as detailed in the Pyrite Remediation Scheme document. The Pyrite Remediation Scheme is a based on damage to the dwelling - the presence of pyrite alone is not sufficient to meet the conditions of eligibility. The Information Leaflet for Homeowners in the Publications section gives indicators on damage to dwellings from pyrite heave. It describes the factors to consider before obtaining a Building Condition Assessment from a competent person. Prior to making the application, damage to the dwelling is assessed visually (Building Condition Assessment) by a competent person in accordance with Irish Standard I.S. 398 Part 1: 2013. Further details on this matter are outlined below. How is pyrite damage assessed? Prior to making the application, a Building Condition Assessment must be undertaken. The damage to the dwelling is assessed by a competent person in accordance with Irish Standard I.S. 398 Part 1: 2013. This Standard has been established to assess if damage to a building has been caused by pyritic heave. The competent person (e.g. a registered engineer, architect or building surveyor, with sufficient theoretical and practical training, experience and knowledge appropriate to the nature of the work) carries out a desk study and a visual inspection of the dwelling to establish whether the damage visible in the dwelling is indicative of pyrite induced damage. The Building Condition Assessment must record a Damage Condition Rating of 2, as defined in the Irish standard I.S. 398-1: 2013 Part 1, in order to meet the Scheme’s eligibility criteria. How do I select a competent person to carry out the Building Condition Assessment? Engineers Ireland http://www.engineersireland.ie keep a register of professionals who have undertaken training and are certified as competent to carry out Building Condition Assessments. Other professional bodies, e.g. Architects and Surveyors may be consulted with regard to competent persons in their profession. 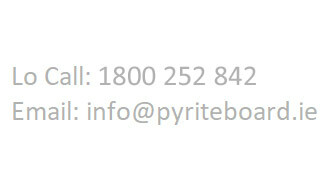 The Pyrite Resolution Board only accepts online applications. The online application form can be accessed via the "Apply Now" link at the bottom of this page. You may find it useful to refer to the application template in the Publications section of this website before completing the application form. A pdf copy of the Building Condition Assessment must be attached to the application and it should be noted that the report must record a Damage Condition Rating of 2, as defined in the Irish standard I.S. 398-1: 2013 Part 1, in order to meet the Scheme’s eligibility criteria. The submission of an application is deemed as the applicant’s acceptance of the terms and conditions of the Scheme. An acknowledgement, including a unique reference number, will be issued to you when the application is lodged. The PRB will consider the validity of the application under the eligibility criteria. You will be notified by email of the decision to refer the application to the Housing Agency for the Assessment, Verification and Recommendation Process or of the decision to refuse the application. Once your application has been referred to the Housing Agency, you will be able to track its progress online by clicking on the link "Apply Now" below. CLICK ON THE LINK BELOW TO REGISTER A NEW APPLICATION OR COMPLETE AN EXISTING APPLICATION. If your application is refused, you may appeal the decision. The procedures prescribed by the Pyrite Resolution Board for the hearing and determination of appeals can be found in the Appeals Procedure. An appeal must be submitted on the prescribed appeal form which can be found below and submitted in hardcopy or electronic format.